Online dating brings quite literally a world of opportunities, and that in turn raises the question: How wide should you make your search for love? The answer of course will depend on your personal circumstances and preferences, but broadening the geographical options might just be a great way to enrich your experience and increase the chances of finding that special someone. So, what happens when you find someone you want to date who is miles away or someone closer to home who has to relocate for a period of time? While it does bring its own set of challenges, plenty of great relationships have begun and stayed the course despite the couples being far apart for a period of time. 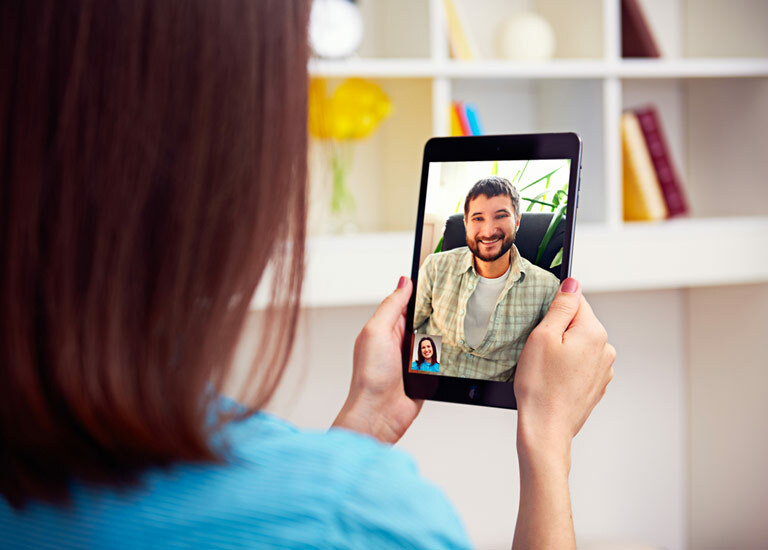 Skype is your friend, as is FaceTime. It’s worth both ensuring you have a good, reliable Wi-Fi connection and scouting out free spots near to home/work/university. If possible, invest in a decent smartphone package that’ll make video calling and messaging a pleasant, rather than frustrating, experience – and this needn’t break the bank, there are plenty of great budget options on the market now. Be careful with texts and emails though – it can be easy to misinterpret and be misinterpreted in brief messages. Keeping clear and open communication is really important. While technology is wonderful, there’s a particular charm in receiving letters and parcels. If you’re creative, consider drawing, painting, or making something, or you could buy occasional surprises to pop in the post. Travelling can be expensive, especially at the last minute, but it can also be as cheap to fly to the continent as it can be for a few miles in a taxi. The trick is to catch the deals and plan ahead. Coach travel may not be glamorous, but often brings the thriftiest bargains and planes can be cheaper than trains with deals and comparison sites. Overnight stays can also be surprisingly inexpensive with basic bargain hotel chains, hostels and Airbnb. Sign up to mailing lists and loyalty schemes for great offers and ask around for potential car sharing buddies. Make sure you do meet the person in real life before you get involved in a relationship. Unfortunately, not everyone is who they claim to be, and while this shouldn’t be a reason to be put off by distance dating, it’s important to get to know the person face to face ahead of serious involvement and emotional investment. And in the ‘getting to know you’ period, keep meetings to public places. The best way to learn patience is to be in a situation where you have to be patient. No one relishes this, but not having the easy access of a locally located significant other can actually be character building, bringing opportunity for personal growth, spiritual maturity and the development of strong foundations in the relationship. So, if you’re not already a pro at being patient, now’s the time to become one! Tamarin Fountain trained and worked as a professional actress, before travelling the world in events and entertainment roles on board cruise liners. Tamarin now lives in Edinburgh where she works in Project/Change Management, is an aspiring comedienne and cares deeply about the issues surrounding dating, singleness and emotional wellbeing for Christians. You can follow Tamarin on Twitter or read her blog here. Be the first to read new articles every Tuesday. No spam. Unsubscribe anytime. Christian Connection is an award-winning Christian dating website in the UK, Australia, Hong Kong, Singapore, USA and Canada. Since the UK launch in 2000, thousands of Christians have found friendship, love and marriage through the site. Want to write for us? If you would like to write an article for this blog, find out how. Disclaimer - The views and opinions on this blog are those of the authors and do not necessarily reflect the views and opinions of Christian Connection. © 2019 Widernet Communications Ltd. All rights reserved. No part of this site may be copied or reproduced without permission.